Add buttons on a worksheet to run macros that help you navigate -- a Back button and a Next button. Watch this video to see the steps, and the written instructions are below the video.. 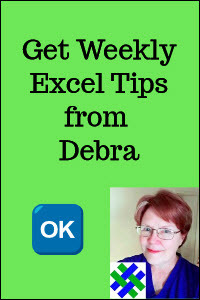 There are two Excel VBA macros in the workbook -- one that takes you to the next sheet in the workbook, and one that takes you to the previous sheet. If you're on the third sheet, click the Next button to go to the fourth sheet. Or, click the Back button to go to the second sheet. First, copy this navigation code to a regular module in your workbook. Save your file as Macro-Enabled (*.xlsm) or Binary (*.xlsb). Now that the macros have been added to the workbook, you'll add the buttons. Now that the macros have been added to the workbook, you'll add the Back button on the first worksheet. Select the first sheet in the workbook. Note: If the Developer tab isn't visible, click the Office Button, then click Excel Options. Click the Popular category, then add a check mark to Show Developer tab in the Ribbon. In the Controls group, click Insert, to see the Form Controls and ActiveX Controls. In the Form Controls section, click Button. On the worksheet, drag the pointer, to add a button of a specific size, or click to create a default sized button. While the button is still selected, you can change its caption and add some formatting. To change the button's caption, select the existing text, and type < Back. On the Ribbon's Home tab, use the font formatting buttons, such as Bold and Font Size, to change the appearance of the button. In the screen shot below, the font size has been increased to 14. Follow the same instructions as above, to add a Next button to the worksheet, with these changes. After the macro buttons are completed on the first worksheet, follow these steps to copy them onto the remaining worksheets. Select the next worksheet, and paste into cell B1, and repeat for all the remaining sheets. After you've added all the buttons, you can test them. To move through the sheets, click either the Back or Next button on any sheet. You can download a copy of the Excel Worksheet Macro Buttons File to see the worksheet buttons and the worksheet navigation code. The file is in xlsm format, and is zipped. After you unzip the file and open it, enable macros, so you can use the navigation macros.